In addition to the extremely light black aluminium handles in two sizes: 200 mm (8 inches) and 250 mm (10 inches), there is also the classic chromed or natural polished bronze solution, always 250 mm long. 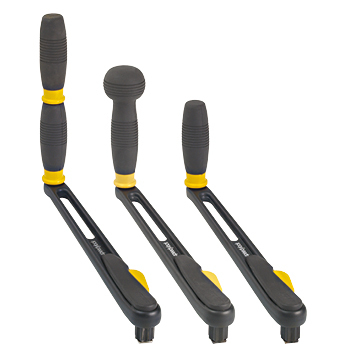 Three different grips are available: the single, the double and the new ball-grip. The handle arm made of forged aluminium with lightening holes is extremely light and resists the heaviest torsion. 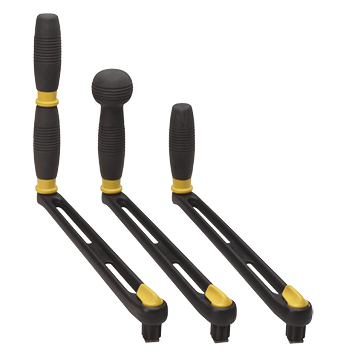 The grip is covered with rubber to give a firm hold and runs on two ball bearings to increase its efficiency (single-grip and ball-grip only). All the models are available with or without the lock system which automatically locks the handle on the winch. To refer to the “no lock” version add /NL to the code.